For those who follow the blog closely you will know there are quite a few 'peat-monsters' within the D.T.W.C. I imagine this is pretty common nowadays amongst whisky clubs and enthusiasts. These 'mud-lovers' tend to be loyal to two Islay distilleries: that of Ardbeg and Laphroaig. The reason I mention this is that I have never consumed a bottle from either brand. This is not because I don't like their malts, but rather that I feel intimated penciling a review due to the increased scrutiny. This all ended recently with my purchase of the Laphroaig Triple Wood. This is the latest expression from this famous Islay distillery, which I have only seen available at Dan Murphy's within Australia. The bottle: let me just say now I am not the biggest fan of medicinal green bottles and this is what all Laphroaig's liquid ships in. I know its probably in keeping with tradition...I know its playing the roll of keeping the contents tucked away from sunlight...but I just find it unappealing. However, seeing as I really liked it when reviewing The Glenlivet 15yo, you could probably just say I am full of sh*t! The nose: a strong alcoholic whiff at first, likely due to the slightly higher-than-normal proof at 48% ABV. On nostril recovery I detected some musty-oak and vanilla fragrances. There are some hints of the Oloroso sherry, with dried fruits and sultanas. I also sense some subtle black liquorice and aniseed. The taste: as the Triple Wood hits the tongue, flavours disperse to all regions of the mouth like an invading army. The smokiness seems to land up front…before it intensity fades to the back of the throat. The peat here is dry and smoky. I find it similar to Lagavulin's tobacco smoke and in contrast to Bowmore's wet-pungent, boggy-style smoke. The Triple Wood has a more delicate peat-smoke…perhaps the sherry is masking some of the usual peaty heaviness? (as mentioned, I haven't reviewed the 10yo or Quarter Cask). The vanilla sweetness parks itself nicely, before the arrival of the briny, saltiness so associated with these Island malts. 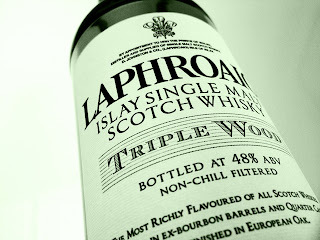 As with most Islay whiskys, the more you drink the more the peat smoke softens, allowing the other flavours to unfurl. I could easily drink he bottle through, this is one nicely balanced whisky. On that note, I could easily see myself purchasing another bottle. I get the impression that Islay purists will not be so impressed with the introduction of sherry casks, which I assume must mellow some of the peat smoke and lesson highly medicinal qualities. For the regulars readers, Baron would cite the diminished 'booty scale' here. In terms of rating, I would give the whisky 5.75 from a possible seven. As a side note, I also own a bottle of the Laphroaig 15yo. This whisky is now discontinued it was supposedly the Prince of Wales favourite. It sits amongst my whisky collection, which features some 'poor man' rare whiskys (i.e. inexpensive whiskys which are now discontinued). However, I recently discovered from a few other members that this bottle is more likely to be an 18yo, as stocks diminished of the 15yo well before they completed selling it. Either way I am not complaining, rather just waiting for the right occasion.